Past Lives and Hever Castler, Kent U.K.
Who we are and what we become as we evolve as conscious human beings is fascinating and surprising. Hever Castle is located in Kent, U.K. Hever Castle is the childhood home of Anne Boleyn and the estate of her father Sir Thomas Boleyn. In 2017 visited Hever Castle to close the circuit, so to speak. I felt ready to review this past life once again but this time from the very different perspective of experiencing a relatively safe, secure childhood. My family's lineage assured a future of becoming a Lady within the structure of English nobility. 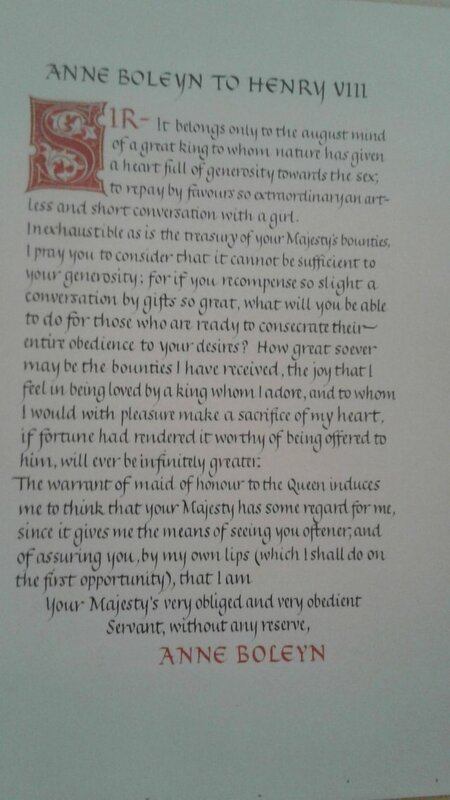 In time and against her will, Anne would become the second wife of Henry VIII but the first of two wives he beheaded. I visited the Tower of London in 1998 specifically to see the dark, dreary room where Anne Boleyn was held prisoner immediately before her death. I wanted to see with these eye the little green patch of land outside of the Tower itself where I was executed. 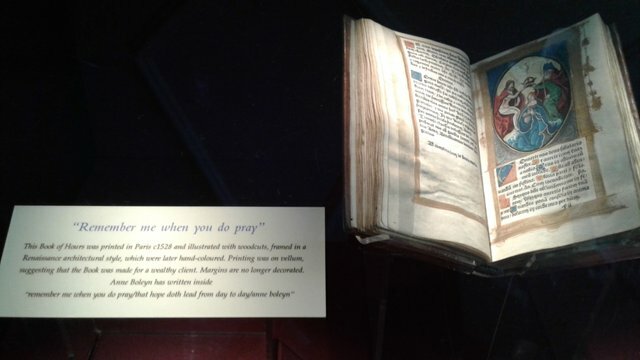 I had visited the Tower of London to put spiritual closure on a past life experience. I have no interest in gore, personal or state violence against women and I don't have a dark steak. 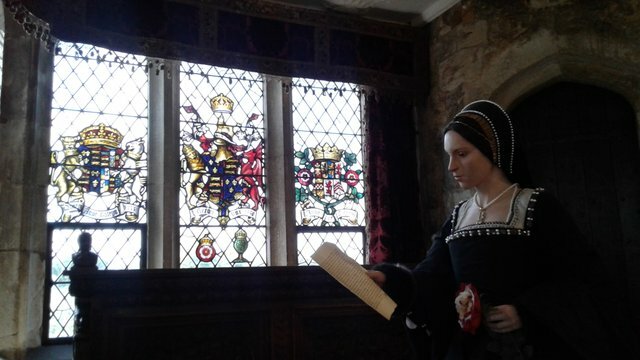 However, under unexpected circumstances of waking up fully to be part of the new paradigm unfolding today, I learned that I was Anne Boleyn in a past life. In another past life, giving my soul history some semblance of balance, I was a slave baking bread, day in and day out, for a large household. That might have been the life in which I fantasized..."Some day I will be a queen and married to the most powerful man in the land." 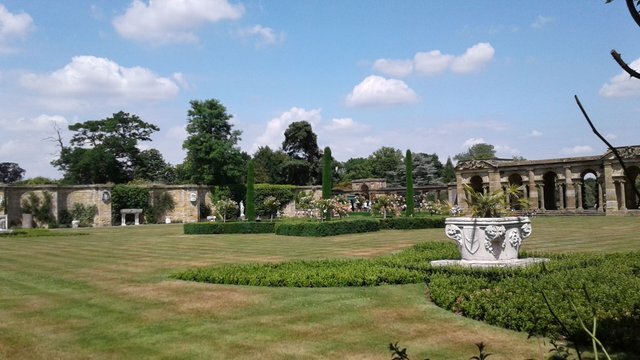 Admittance to Hever Castle is reasonable at $20 per person and this includes access to most of the extensive grounds. 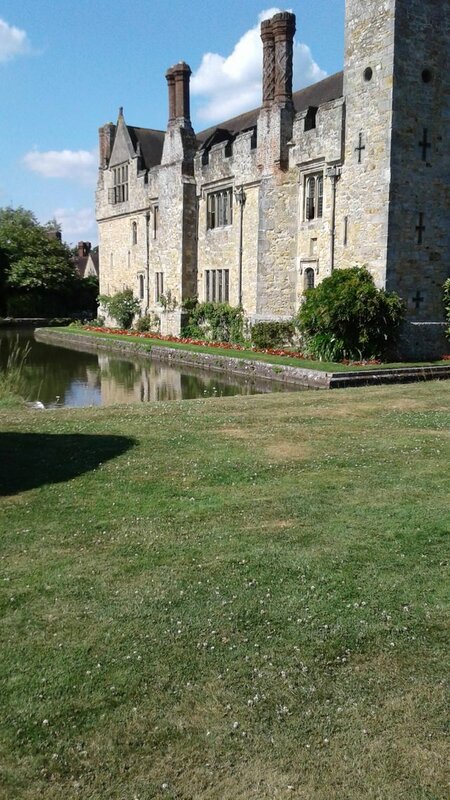 Hever Castle is a wonderful choice for a day trip when visiting London during summer and fall. 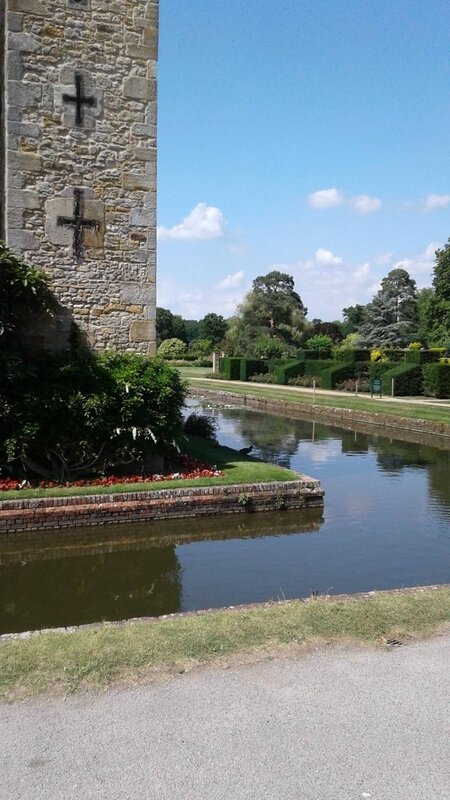 Visitors to Hever Castle can take a boat ride on the lake. The day we visited, swimmers were in the lake and shouts for the Triathlon athletes heard from within the castle could be mistaken as cheers for a jousting event that would have been common in Anne and Henry VIII's time. The castle entrance is narrow and small. The family dwelling of this estate is surrounded by a moat. The castle moat isn't very grand. 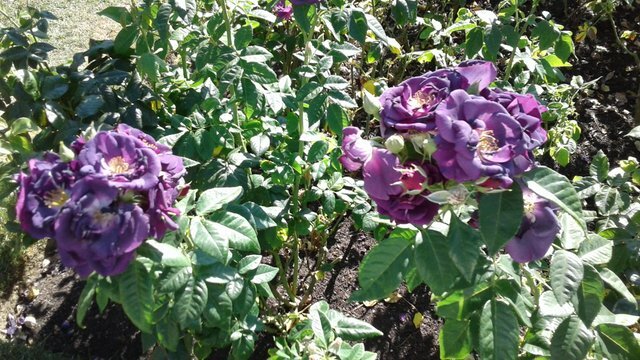 However, additional buildings where servants lived and the food self-sufficiency aspects of life -- an orchard with beehives, a small working farm -- are not protected in this way. 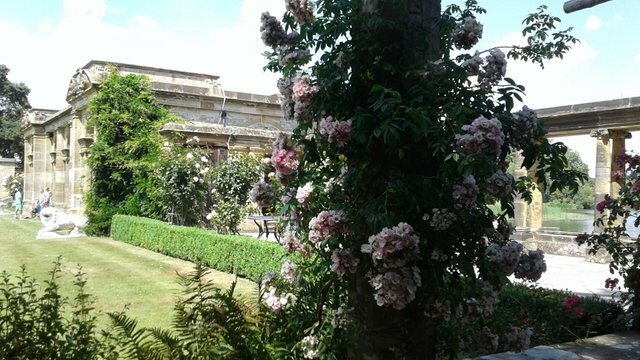 The inner courtyard is modest. 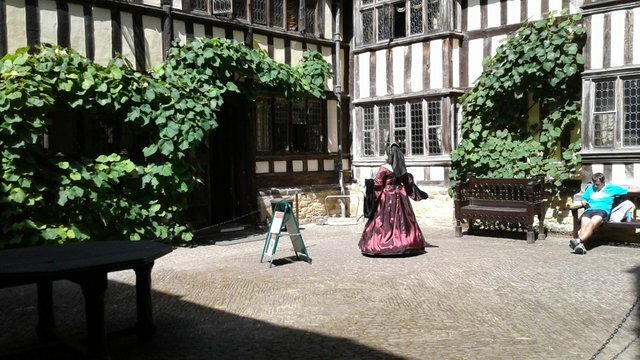 In this photo, the re-enactment player of Lady Anne heads into the house proper on a fine summer day. 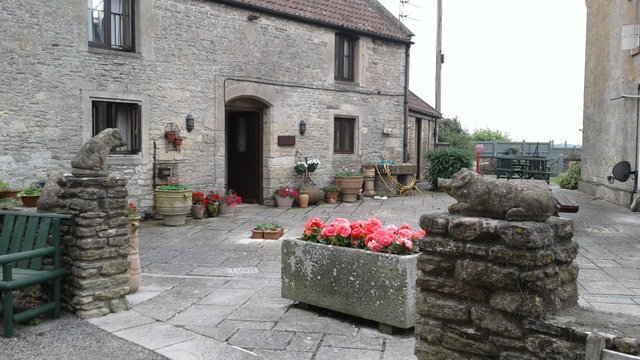 It is into this inner courtyard that King Henry VIII would have dismounted and left his horse to be stabled by a courtier. 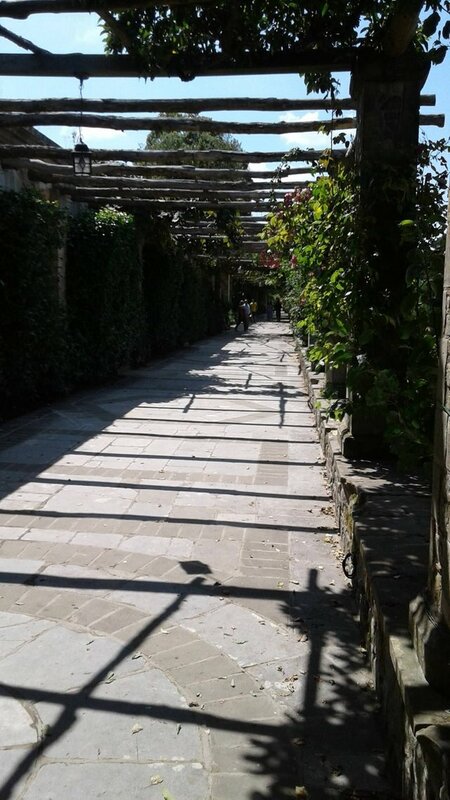 However, the grounds surrounding this estate of the Boleyn family are superlative, especially the many carefully designed garden spaces. Being free to run, play, explore in what for any child and set of siblings would be a vast expanse which included so many delights of nature. 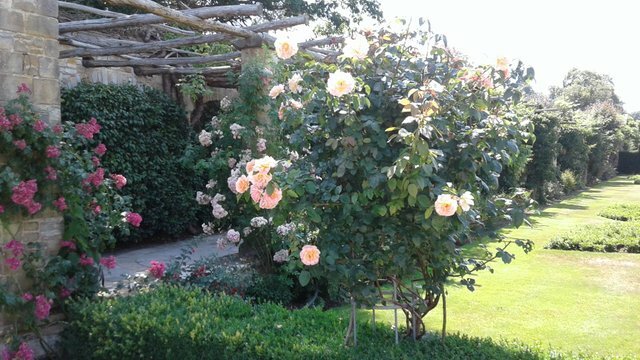 Rose gardens with paved walkways and views to the lake, an herbal garden, a garden specifically designed for private conversation, give the visitor a sense of quiet and calm country life with privacy, security, and plenty of space to play hide and seek under the watchful eye of a governess. Traveling companions, Cynthia vogues as we come to the end of a promenade that leads to the lake. 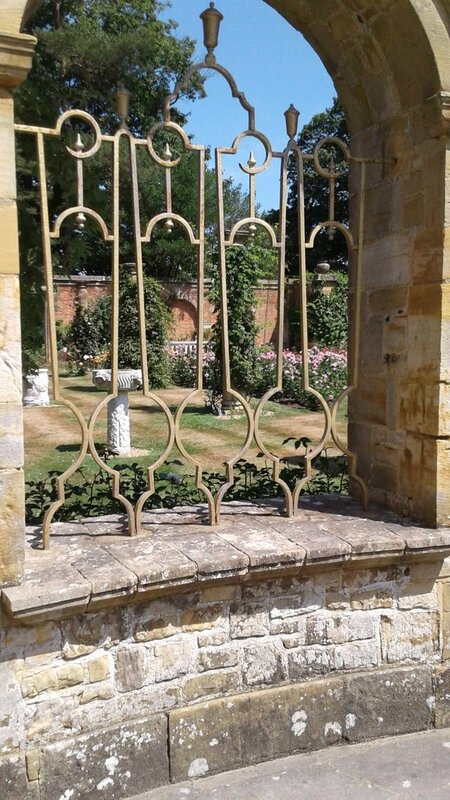 We lucked out on the weather the day we visited Hever Castle, so we spent quite a bit of time exploring the grounds. 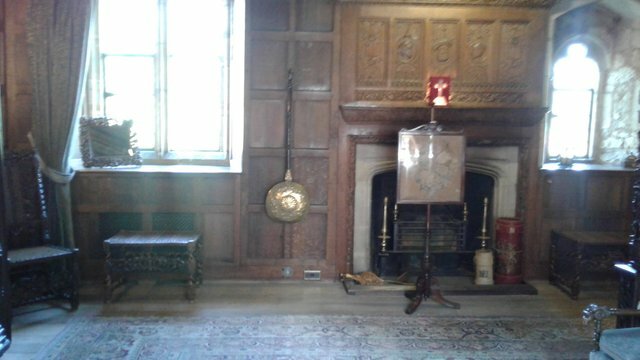 Hever Castle has been appointed as a very luxurious bed and breakfast and I fantasize about returning to sleep on the estate that was such a source of happiness in the early part of my life as Anne Boleyn. 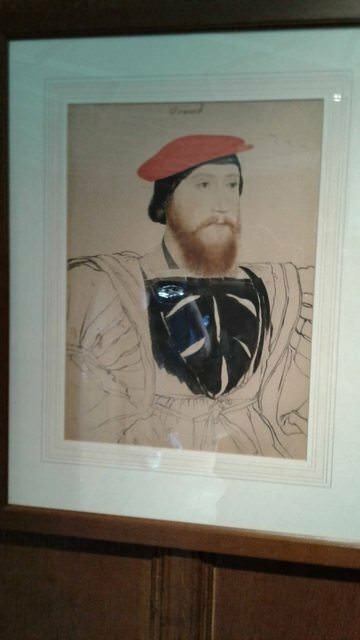 This trip to Scotland, which included doing spiritual energy work on the earth's grid as part of a Sacred Master Key retreat, was part of a glorious co-creative year having reconnected with Henry VIII in this lifetime. Having forgiven this soul for having chopped off my head and choosing to move on with my soul evolution, we "found" each other again to clear up any remaining past karma. 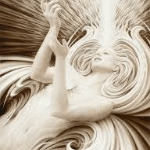 We are doing quite well with supporting each other as we work through and nurture our soul-to-soul connection, which is understandably VERY POWERFUL. 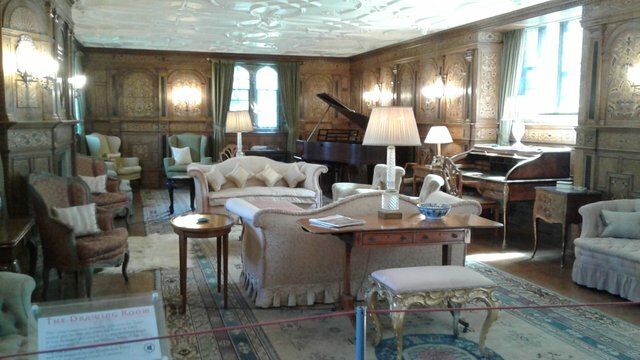 The interior of the Castle is actually quite modest, as English castles go, with very small bedrooms. 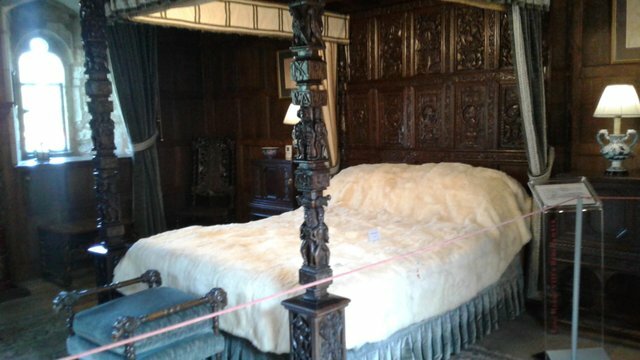 King Henry had the largest bedroom set aside for his regal comfort. 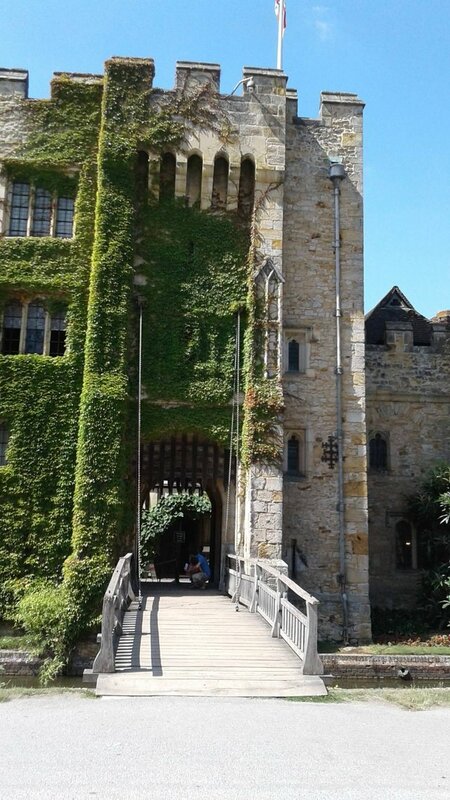 He visited Hever more than once as he wooed Anne while pursuing a scandalous and vigorously opposed divorce from his first wife (and sister-in-law) Catherine of Arragon. The other family rooms are quite small, and Anne's bedroom was furnished with a 500 year old Murphy bed to save space. 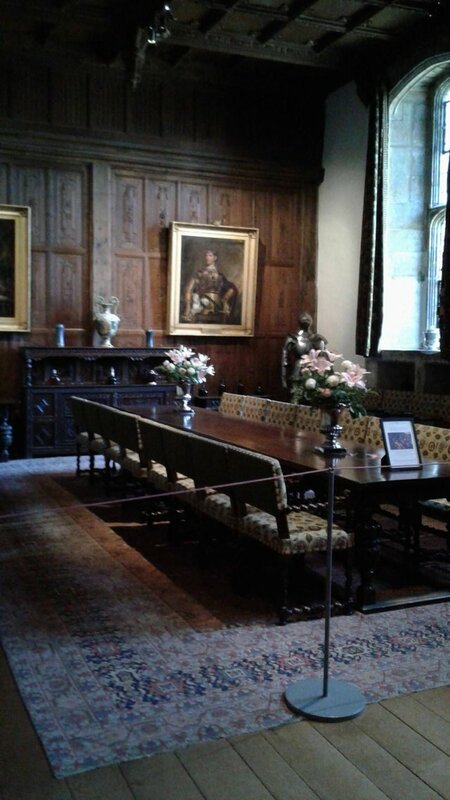 The second floor chapel, with Henry VIII's bedroom just down the hall was another spacious room for family to gather for religious instruction, which included embroidering religious scenes for sisters Mary and Anne. 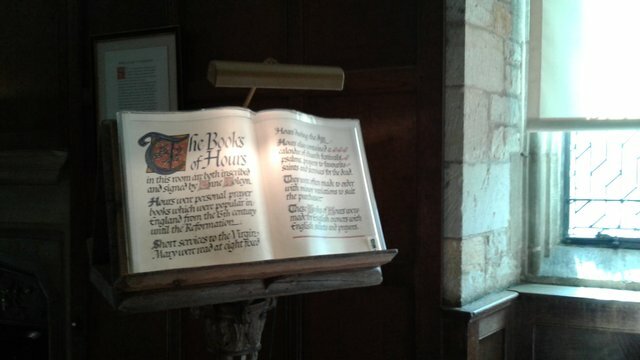 Anne Boleyn's bible is exhibited in the upstairs chapel. 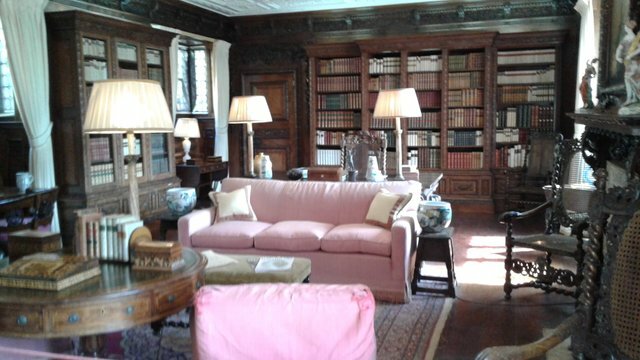 On the upper floor there is a portrait of young Elizabeth, Anne and Henry's daughter, who became Queen of England, Elizabeth I. 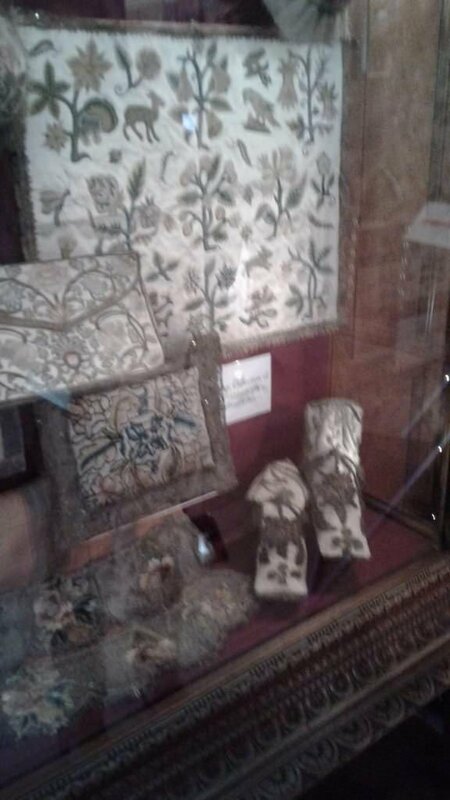 Being a textiles design student in my college days, the examples of noble finery were appreciated. 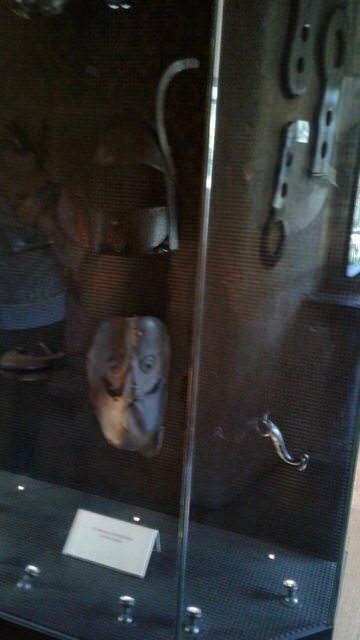 No stately noble homestead should be without its own torture facilities. 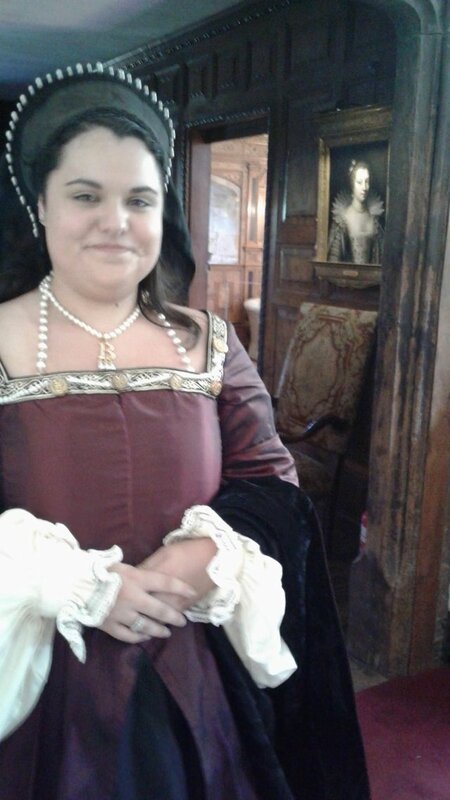 My friends and I enjoyed our time at Hever Castle. After all, we had been siblings in the life at Hever. George, Mary and Anne returned as the people we are today, Anastacia, Cynthia, and Anaiis. 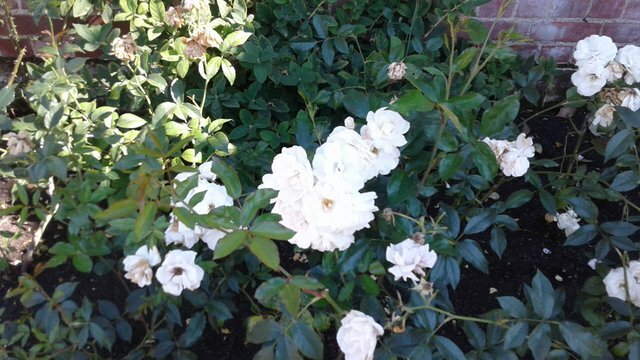 We three were between ending a spiritual retreat in Salisbury where we performed grid work on behalf of Gaia's energy field and sleeping in Andover for two nights as we bid good-bye to participants. After our visit to Hever Castle spending the night at Toll House Farm bed and breakfast with lovely hostess Laura before making our way to the town of Bath. This post is by an @earthnation Steemit Guild Community member.